This month does seem to have some interesting offerings, from some leading French skincare companies, and a couple of repeats. I would have liked the chance to try the Huygens Le Gommage Visage, and Cynthia Rowley’s Beauty Brightening Illuminator, but I have at least two products that I would choose to use, and that’s the hairspray and cleanser. I knew a self-tanning product would crop up, even though my profile states I do not tan, or like a tanned look, but it’s a product that is seasonal. As I know, these are marketing boxes that are hit or miss, but you pay for that privilege. One good thing is the box is styled as a drawer which is much more useful, and would be a deal breaker if when it comes to subscribing if they continued this trend. Birchbox seem to be making more of an effort to create a club or community feel, not only with the points system, but also by sending subscribers offers to upgrade their boxes. One month there was an offer to buy a Rifle Paper Notebook at a discount, and this month was an offer to buy Quay Australia sunglasses at 40% off. While I think these are nice touches, there isn’t any guarantee with these items if they arrive broken or not as expected. Out of all the boxes this has been the best, even if I won’t use all of the products. They lost 0.25 of a point as I asked for the palm tree box and got the pineapple one. It doesn’t really matter, but does indicate that they don’t really take any notice of requests or profiles. I just don’t see the point of them if they are ignored. 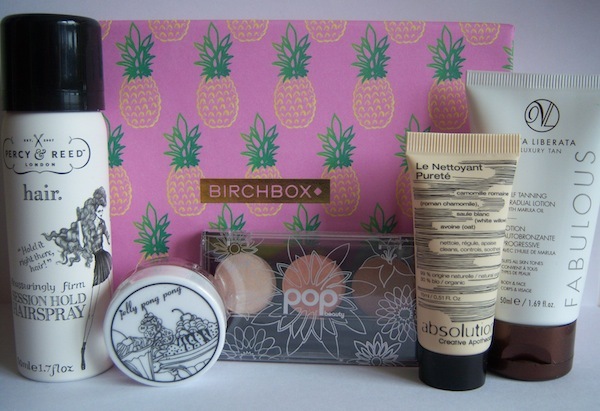 Delivery was not as good as it has been with the change in courier, but things seem to be improving at Birchbox. The brands are better, and the luxe sizes are bigger this month. Hopefully this will continue.